Review: First off – check out the cover. The image screams intensity. Miles is having some serious doubts about being a superhero. His powers are acting up and he is wondering about who he really is deep down. With everything else going on in his life, Miles is one stressed-out kid. Alicia is a pleasant distraction who happens to love poetry. Poetry features prominently in this book which makes sense with Reynolds as the author. The poetry adds another layer to the story and in some cases it adds humor – especially with Miles’s best friend Ganke. Humor shows up many times throughout the book. I appreciated some of the descriptive phrases like, “As opposed to the stench of toxic toes in the hallway, the bathroom smelled more like wet dog and corn chips.” Eew! Also, sounds about right. Much of the story takes place in and around school with poetry and history getting most attention. Miles is into math, but with Alicia in the picture, poetry becomes more important. There’s an open mic opportunity and as you might guess, Miles works on some poetry for Alicia. He is tongue tied around her most of the time, but is at least able to write something down. There is quite a contrast between his superhero abilities and his ability to speak to a girl. The story and characters are compelling and there is a lot going on besides the typical scenario of superhero attempting to foil the plot of an evil mastermind. Of course that is there, but there’s also a romance, friendship, awesome parents in the picture, and discussions about race specifically in the context of education. History class is where things get complicated. It’s in history that Miles’s spidey-sense gets wacky and it’s also in history class where some bizarre discussions happen. His teacher, Mr. Chamberlain, encourages discussion around the positives of slavery and the confederacy. The points Mr. Chamberlain makes are morally reprehensible and pretty much leave students in a dilemma. Is the teacher just playing with them or does he really believe this mess he’s spouting? Regardless, what is the proper response that won’t get a student sent to the office or even expelled? Miles is basically told to stay where he belongs and comply even in the face of racism and discrimination by his teacher. Of course, school is not the only thing going on in the story and though it’s a while before it becomes clear, there is a public enemy for Spider Man to deal with and the confrontation has plenty of action. Recommendation: Get it now especially if you are into superheroes or poetry. There’s a ton to love in this book. 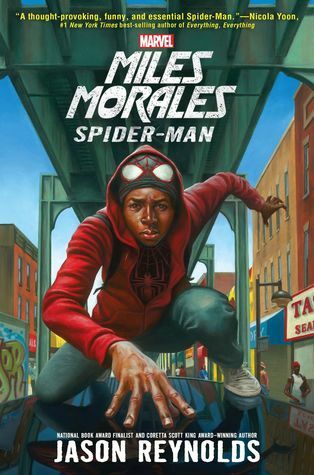 Miles is a character I want to see more of and I hope that’s the plan.